The most surprising thing about Lori Anderson’s exquisite wildflowers is not her attention to detail, it’s the materials she uses to craft her perfect reproductions. Each flower is made of cornshucks — a flame azalea (pictured), a dwarf crested iris, a flowering dogwood and many others — all native to the Smokies. Recently accepted into the Southern Highlands Craft Guild, on Saturday Lori was demonstrating her craft at The Cottage Craftsman (above) in Bryson City, where her work is for sale. 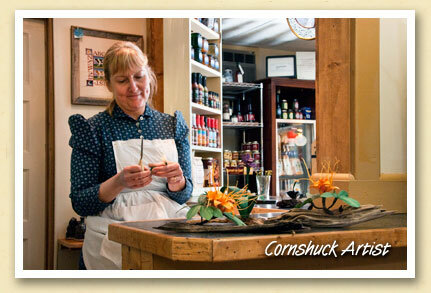 And she’ll be at the Great Smoky Mountains National Park’s Annual Spring Wildflower Pilgrimage, April 21st thru 25th. It’s the beginning of the wildflower season in the Smokies. For a blooming calendar, visit the Hiking page of the Bryson City Online Travel Guide.